Here are two contacts if you are interested in visiting with someone about treating ash trees: Randall Bollinger with AshSavers – 402-613-6139 and Randy Masek with Masek Tree Care – 402-464-0435. We want to recognize and THANK all of the homeowners that have contributed their time and effort to keeping the drainage way and commons free of debris, trash, etc. YOUR EFFORTS ARE APPRECIATED!! Please recognize the efforts of our commons committee members: Detlef Gartzke, Alex Lowell, Rich Butalla, Kent Lovelace, Charles Williams, Jim Stepanich, Scott Tinkham, Lon Pomajzl, Dave Holland and Joe Shandera. We are always looking for additional volunteers! 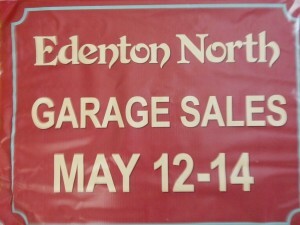 Garage sales were held on the weekend of May 17 – 19. THANK YOU and JOB WELL DONE goes to Vicki Stepanich who coordinated these sales in the neighborhood. Corresponding dates for 2019 are May 16, 17 & 18. Gana Excavating completed the repair of four areas in the commons drainage system. Area 1 – North pond touch up at South inlet; Area 2 – Outlet at Shirl Drive; Area 3 – South pond pipe; Area 4 – Remove and replace end of concrete flow liner on east side of north pond. Work was started in December and completed in March. Acme Tree Service completed the removal of two dead/dying trees as well as the trimming of some branches broken in storms and raising the canopy of others. Christensen Tree Service had the low bid to remove a large White Pine by the North pond. Acme Tree Service had the low bid to remove a tree that had split and a large portion was broken off in one of our spring storms located in the far south commons. Even with all this work, there were several trees that needed to have their canopy raised to facilitate mowing as well as some volunteer trees that needed to be removed. Jim Stepanich was the Lead Tree Technician using his chain saw and Gator with trailer. Kent Lovelace and Joe Shandera assisted moving the branches. A big THANK YOU for the work accomplished. Also, a shout out and THANK YOU to WILL REFUSE & RECYCLING. They picked up our piles of branches at NO CHARGE! While on the subject of trees – neighbors should be aware that several of the willow tree branches in the commons south of Shirl Dr. may look healthy and strong, but in fact, they may be hollow on the inside. We would suggest that your kids and grandkids not be allowed to climb on these branches. SAFETY FIRST! Grasshopper Lawn Care Company is again providing services in the 2nd year of a two-year contract. We have received several calls concerning missed areas. They have experienced several issues with staff turnover and equipment breakdowns. Bids have been solicited from 10 different companies for mowing, fertilizing and weed control for next year. One6 Lawn Service has been contracted for care of the commons beginning in the spring of 2019. In late summer of 2017, the fountain in the north pond quit working. When the fountain was pulled from the pond, it was determined that the motor had taken in a large quantity of nylon fishing string, which resulted in the motor locking up. The board approved replacing this fountain with a 3/4HP Display Aerator and light kit from Discount Pumps. Some interesting features of this fountain: 5 yr. warranty, 230v, water is moved by a propeller, and it does not have to be removed in the winter. Total cost for Display Aerator, Light kit, installation and electrical work was $2962.09. FOR SALE: ALPINE 100 Watt MULTI-LIGHT TRANSFORMER with photocell and timer sold on Amazon for 49.99. This was a part of the light kit but wasn’t needed. The Edenton North commons is generally considered a flood control area. Since the beginning of the Edenton North Homeowners association, the commons committee has worked to enhance its’ value to Edenton North homeowners. 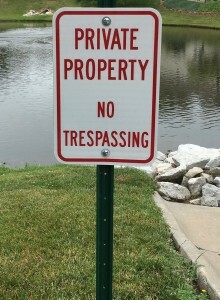 Users of the commons area should always respect the property and privacy of neighbors. We salute the many homeowners who have already spent much time and effort making the commons behind them a beautiful area. We encourage all property owners to assist with keeping the commons area free of trash and debris. Any work that individuals do toward making the commons a nicer area will be appreciated by the entire association. 1. No sheds or storage of any type should be placed on the commons. 2. No compost, leaves, grass clippings, bush or branch trimmings should be placed or left on the commons. Also, pet owners should follow city regulations and pick up after their pets. 3. Property owners willing to plant trees should contact a commons committee member before planting. City and NRD guidelines need to be followed as well as the general plot map developed by the commons committee. Based on these criteria, approval of the plantings needs to be given by the commons committee prior to planting. Property owners are encouraged to assist with the watering of new trees planted behind their property. 4. No gardens should be planted on the commons. 5. The ponds are part of the Edenton North commons and are posted as private property. Restrictions on use of the commons applies to the ponds as well. Fishing is permitted on a “catch and release” basis. 6. The commons committee will plan a general clean-up of all areas when needed. All property owners are encouraged to be active participants in these projects. 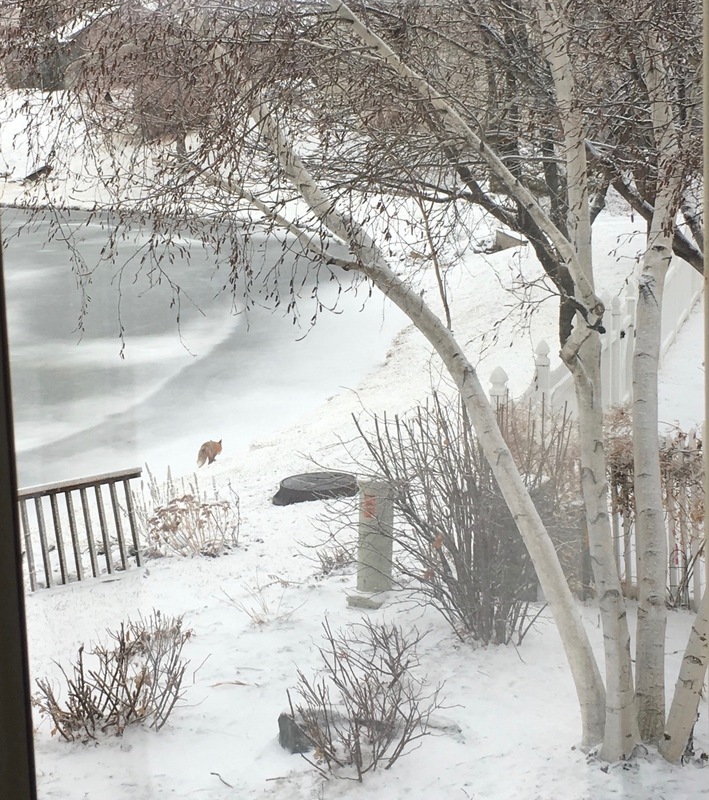 We have seen a fox in the commons behind our house several times over the past months. This morning, I was able to take a few pictures. 1. In late summer of 2016, the fountain in the south pond as well as the aerator in the north pond quit working. The board approved replacing both of these items in the spring of 2017 – a Kasco 3400 VFX 3/4 hp fountain and Kasco Fountain 3 Light kit from Aquatic Ponds for $1935.18 plus installation and new aerator from Nebraska Lake Management including installation for $581.18. In June, 2017, the timer box for the fountain in the North Pond quit working (possible power surge or lightening?). The timer box that was a part of the new fountain purchase was used as a replacement. 2. Grasshopper Lawn Care Company began providing services under a two-year contract this spring. As expected, there have been a few issues that I have had to contact them about as they learn the area. They have been responsive and good to work with so far. 3. Every year, we have some trees that need to be trimmed or removed. Acme Tree Service has been the low bidder in the past and has been contracted to remove two dead/dying trees as well as trim some branches broken in storms and/or raise the canopy of others. $1450 has been allocated for this work. 4. This spring, the city cleaned out silt and debris in Antelope Creek near the west side of the Lucile Drive bridge. This has resulted in better flow in the creek. The city intends to clean out the east side but access is an issue. City workers took care of replacing a section of broken sidewalk as well as repairing damage in the commons. 6. Guidelines established in 2005 for the commons were updated. A copy is attached to this report. 7. Garage sales were held on the rainy and chilly weekend of May 18 – 20. Corresponding dates for 2018 are May 17, 18 & 19. Please consider being the chairperson for this event. 9. We want to recognize and THANK all of the homeowners that have contributed their time and effort to keeping the drainage way and commons free of debris, trash, etc. YOUR EFFORTS ARE APPRECIATED!! Please recognize the efforts of our commons committee members: Detlaf Gartzke, Alex Lowell, Rich Butalla, Kent Lovelace, Charles Williams, Jim Stepanich, Scott Tinkham, Lon Pomajzl, Dave Holland and Joe Shandera. We are always looking for additional volunteers! 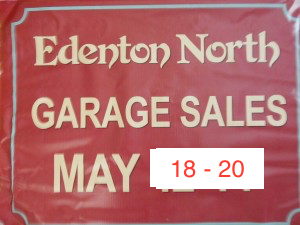 The dates for the Edenton North garage sales will be MAY 18, 19 and 20. The Fall of 2015 and Spring of 2016 were a busy time for the Commons Committee. This report will detail the activities undertaken to maintain the Edenton North Commons. 1. Last fall, two big projects were completed. Detlaf Gartzke, Charles Williams and Joe Shandera placed mulch around young trees purchased through NRD tree grants. Also, MANY wheelbarrows of sand, gravel and dirt that had accumulated in and around the culvert behind 4941 and 5001 S. 75th were removed. Kent Lovelace, Detlaf Gartzke, Charles Williams, Alex Lowell and Joe Shandera provided the manpower. 2. 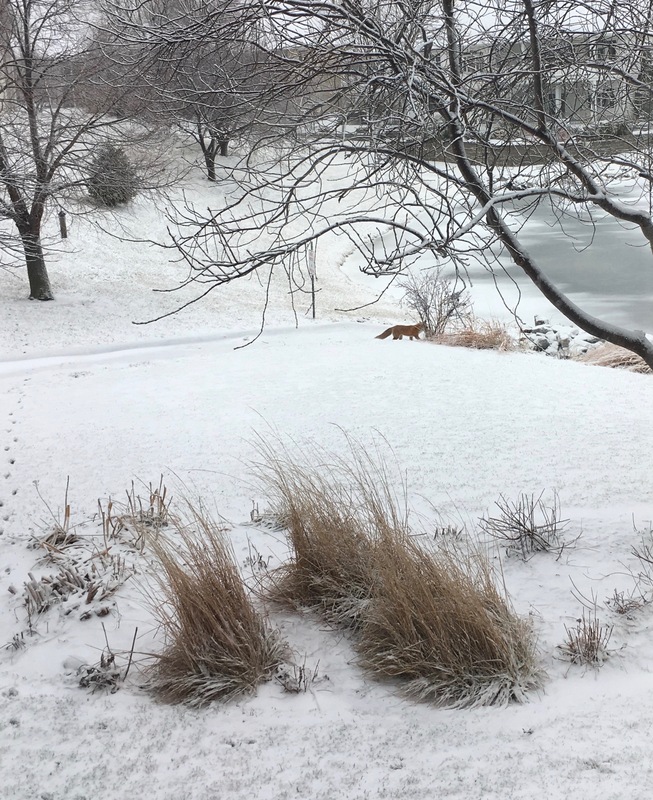 Bid proposals for Herbicide and Algaecide treatments for the ponds and control of phragmites were sent out in early February to three companies. Bids were received from two of the companies. A three year contract (2016–2018) with Nebraska Lake Management was authorized by the Board. Rates for the duration of the contract will remain the same as 2014 and 2015. 3. The winter was tough on a large willow tree near the South pond as well as several other branches in other trees. Bids proposals were requested from 5 companies. Three bids were received ranging from $400 to $3000. The board approved a contract with Acme Tree Service to complete this work. Given the age of some trees, Commons Committee has recommended that $500 be included in the 2016-2017 budget. 4. On March 19th, Jim Stepanich, Charles Williams, Kent Lovelace and Joe Shandera met to clean up debris along Antelope Creek near Lucile Dr. Joe Shandera has contacted the Public Works Dept. concerning the buildup of silt and debris near the Lucile St. bridge, partially blocking the flow of Antelope Creek. They agreed that it needed to be cleaned out but nothing has been done so far. Special THANKS to Kent Lovelace for his cleanup of the branches on the south side of Shirl Dr. and to Lon and Cindy Pomajzl for their cleanup of the wetlands area behind their home. We also want to recognize and THANK all of the homeowners that have contributed their time and effort to keeping the drainage way and commons free of debris, trash, etc. YOUR EFFORTS ARE APPRECIATED!! 5. A repair kit had to be installed in the South Pond aerator this spring as well as some replacement parts in the fountain for the North Pond. Also, after one of our BIG RAINS, both fountains had to be cleared of debris that had been sucked into them. 6. Bid proposals for mowing, fertilizing, and weed control in the Commons beginning in 2017 were sent out to 12 lawn care companies. In the process, our present contractor notified us that he would not be bidding due to a change in his other job responsibilities. Three bids were received and the Board has authorized a two year contract (2017-2018) with Grasshopper Lawn Care Company. Rates will be slightly lower for some services with an annual savings of approximately $500. 7. This spring has seen a growing problem with non-association persons fishing in the ponds. Some examples of issues observed include climbing/sitting on retaining walls, swimming out near the fountain to untangle fishing line, late night/early morning fishing, leaving trash around the ponds, etc. Ponds are private property and not meant as a public use area. Section 19 of the Covenants states that “Class “A” members of the Corporation shall have a right to use and enjoy the Commons….”. Please observe these guidelines. The Board has authorized the purchase and installation of No Trespassing signs. 8. Nextdoor website (https://familyacresne.nextdoor.com/news_feed) looks like a good website to keep in touch with neighbors. Check into it! 9. Gana Excavating has been contacted to look at some bank stabilization needs and the condition of inlets and outlets throughout the commons. 10. Please recognize the efforts of our commons committee members: Detlaf Gartzke, Alex Lowell, Rich Butalla, Kent Lovelace, Charles Williams, Jim Stepanich, Scott Tinkham, Lon Pomajzl, Dave Holland and Joe Shandera. We are always looking for additional volunteers! 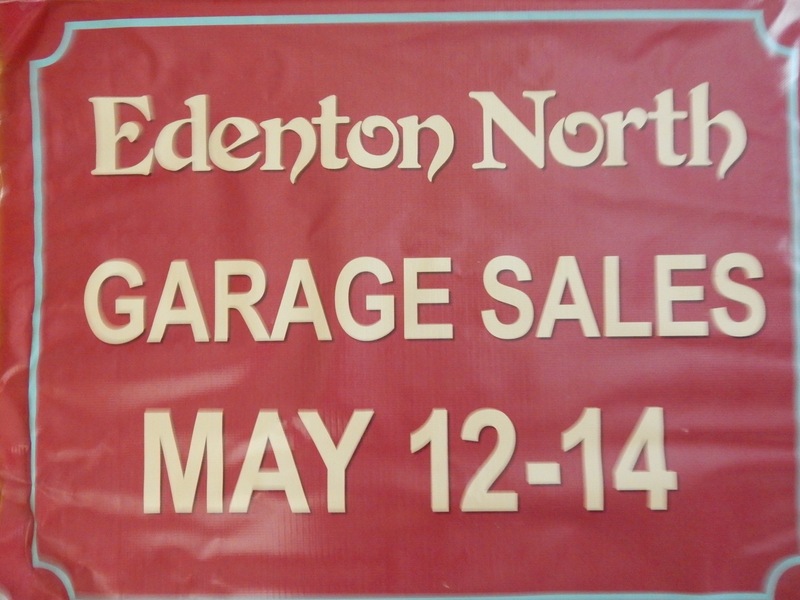 The dates for the Edenton North garage sales will be MAY 12, 13 and 14. Earlier dates were announced for the following week but several neighbors pointed out that the last day of school is May 19th and East High graduation is May 22nd. With all the events surrounding those dates, having garage sales at the same time would present several conflicts. Please let your neighbors know of this change. The monsoons of this spring were an excellent test for the Edenton North drainage way and commons area. All parts passed with flying colors. This is a tribute to the foresight and leadership of board members and commons committee members from our inception in 2004 to the present. It is also a tribute to all of the homeowners that have contributed their time and effort to keeping the drainage way and commons free of debris, trash, etc. YOUR EFFORTS ARE APPRECIATED!! 1. The commons area and ponds are still being cared for by the same companies. There has been no increase in fees. 2. The motor for the fountain in the North Pond quit working near the end of last summer and had to be replaced. 3. Shortly after one of our earlier storms this spring, it was noticed that the aerator in the North Pond was not operating. Rob Hofpar, from NE Lake Management, looked at the unit and determined that both the compressor and cooling fan motor were in need of replacement. He could not tell if lightning, some type of electrical surge or age (installed in 2005-2006) was the cause. Money to replace these items is included in the 2015-2016 budget. Also, some service work had to be done on the start capacitor switch on the aerator in the South Pond earlier in the spring. 4. We were successful in obtaining a NRD Tree Grant for 11 trees. These were planted last fall and are doing well. The Commons Committee would also like to recognize those property owners who have donated and planted a tree(s) in the Commons and would encourage others to consider such a donation. Only requirement – check with a Commons Committee member before planting. 5. Last fall, Aim High Tree Service went through the entire commons removing dead branches and raising the canopy on many trees. This resulted in better access for mowing as well as fewer branches lying in the Commons this spring. Again, a SPECIAL THANKS to all the homeowners that assist in picking up tree limbs after storms. 6. A new issue that we have begun work on is the culvert in our Commons behind 4941 and 5001 S. 75th. Street water from drains in the area of 75th & Sumac comes into our commons at this point. A neighbor noticed that water was standing in the culvert. Part of the issue is that sand, gravel and dirt washes off the street and has accumulated below the culvert not allowing water to freely move away from the culvert. We have been in contact with the city as well as Stoll Grading in an attempt to resolve this issue. 7. Another issue that we will start working on is the wetlands area at the north end of the north pond. A pile of brush washed up from Antelope Creek that the homeowner had removed. Also, the vegetation has grown out of control due to all the rains. We are in contact with our mowing company to get a price to trim up the area. 8. One of the requirements of a NRD Tree Grant is to maintain the trees for a minimum of 3 years after planting. The grant provides $5 per tree for this. Money for this purpose has been placed in the 2015-2016 budget. 9. New neighborhood website: https://familyacresne.nextdoor.com/news_feed This looks like a good website to keep in touch with neighbors. Check into it! 10. Please recognize the efforts of our commons committee members: Detlef Gartzke, George Schell, Rich Butalla, Kent Lovelace, Charles Williams, Charles Daniels, Scott Tinkham, Dave Holland and Joe Shandera. We are always looking for additional volunteers!